Education in Tripura has developed at a very fast pace since its formation on 21st January 1972. The beautiful small state of Tripura offers immense opportunities for students from within and outside the region. As per the census of 2001, literacy rate of Tripura is 73.66%. The Government of the state has taken a number of steps to develop the educational set up of the region. A free and compulsory education policy was introduced by the government that caters free education to the students who fall in the age group of 6 to 14 years of age. The education system of Tripura can be divided into four stages, they are the primary stage which comprises of Classes I-V, the middle stage consisting of Classes VI-VIII and the secondary stage comprising of Classes IX-X. Classes XI and XII are the higher secondary stage of education. Tripura education department was established with the aim of enhancing the academic scenario of the state. It looks after the education system at various levels in Tripura. Later, the department of education was further divided into three sections namely Education (school), Social welfare and Social Education Department and Education (higher). The state government is making every effort for spreading education even to the grass root level. The compulsory and fre e education scheme launched by the government provides education to the students within six to fourteen years of age. Schooling system in Tripura is divided into four stages namely primary stage, middle stage, secondary stage and higher secondary stage. 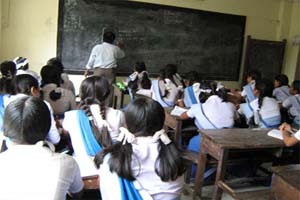 Different Kinds of Schools in Tripura Various government as well as private schools operates in the state of Tripura. One can also come across various religious institutions functioning here in this small state of India. The schools in Tripura are either affiliated to the Tripura Board of Secondary Education or Central Board of Secondary Education (CBSE). Some of the schools are also affiliated to the Council for The Indian School Certificate Examinations (CISCE).